19 December 2016 - Assembly of the pre-production example of the Nash MVW3 is well underway and reflects the fruits of the development testing that took place in the first half of 2016. 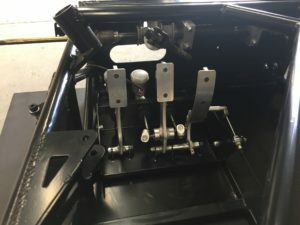 These include modifications to the tubing for the cockpit sides that create additional arm / elbow room for both driver and passenger as well as enhancing side impact protection. 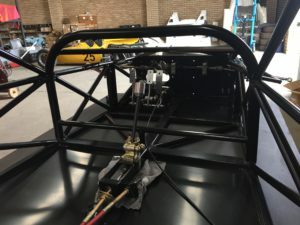 The main scuttle hoop has been raised to provide more generous access to the footwell which itself has had more impact protection added for peace of mind. During the unexpected delays in finalising the chassis tube detail for laser-cutting purposes, the production team were able to move ahead with fabricating and assembling a number of sub-assemblies with the result that items such as pedal boxes, gear lever assemblies, wheel uprights as well as brake discs & calipers are complete and can be quickly added to the newly powder-coated chassis. As hoped, the quality of the powder-coating is excellent and its smooth satin sheen will be the perfect complement to the various plated, coated, or polished components being assembled.